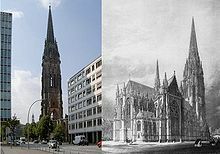 The Gothic Revival Church of St. Nicholas (German: St.-Nikolai-Kirche) was formerly one of the five Lutheran Hauptkirchen (main churches) in the city of Hamburg. Bombing of Hamburg in World War II destroyed the bulk of the church and its rubble was removed leaving its crypt, its site and tall spired tower, largely hollow, save for a large set of bells, together serving as a memorial and an important architectural landmark. When Hamburg residents mention the Nikolaikirche, it is generally to this church that they are referring, and not the new Hauptkirche dedicated to Saint Nicholas, in the Harvestehude district. The church was the tallest building in the world from 1874 to 1876 and is the second-tallest structure in Hamburg. Since 2005, an elevator has been installed to a 75.3 metre-high platform. The current condition of the Church of St. Nicholas is the result of the bombing of Hamburg in World War II, removal of its ruinous walls and rubble in 1951 and restoration work to the tower in the 1990s and 2012. The Rettet die Nikolaikirche e.V. (Rescue St. Nicholas's Church) Foundation works to restore further the tower and improve its memorial role, supported by the city of Hamburg, the congregation of the Hauptkirche and various corporate sponsors and private contributors. The organization is charged with maintaining the building's existing structure, restoration, arranging events and displays in the church, and operating an information center housed in the church's crypt. With the founding of the Nikolai settlement and a harbor on the Alster in the 12th century, a chapel dedicated to Saint Nicholas, patron saint of sailors, was erected. This wood building was the second church in Hamburg, after St. Mary's Cathedral. In 1335, some years before the onslaught of the Black Death, construction on a new brick building began. The structure was to be a three-naved hall church in the typical North German Brick Gothic style. This building stood until the middle of the 19th century, undergoing changes, expansions, and withstanding several partial destructions. The tower, which was erected in 1517, burned down in 1589. The tower built to replace it collapsed in 1644. The last tower of the old Church of St. Nicholas was designed by Peter Marquardt. The Marquardt tower had a height of 122 metres and with its characteristic dome was a landmark of the city and jewel of its skyline. As the center of one of the four Hamburg parishes, the Church of St. Nicholas was heavily involved in all the theological debates that were fought out in the city, especially during the Reformation. After the minister Henning Kissenbrügge had resigned in 1524, the residents chose as minister Johannes Bugenhagen, a profiled Reformer and confidant to Martin Luther. The conservative city council was able to prevent his appointment by making Kissenbrügge stay. However, they could not stop the general wave of elected Lutheran ministers in Hamburg; in the Church of St. Nicholas, Johann Zegenhagen was appointed after Kissenbrügge's final departure. The Reformation was completed peacefully, and in 1528 Bugenhagen appeared in Hamburg and became the preacher at the Church of St. Nicholas. He is known for establishing a church order in Hamburg which regulated finances and other church affairs such as the school curriculum. This order continued for 200 years. The old Church of St. Nicholas was the first large public building to burn in the great fire of May 1842. The destruction of the Church of St. Nicholas is described by chroniclers as a particularly moving event for the citizens. It was the first large building to burn, and was an indication of how catastrophic the fire would become. On 5 May the noon service held by preacher Wendt, who stood in for the minister Carl Moenckeberg, had to be cut short and ended with an intercessory prayer for the saving of the church. One obviously did not count on the loss of the church as most art treasures were not saved. The tower was engulfed by the fire at about four o'clock in the afternoon. Despite desperate efforts, it was not possible to contain the fire due to the equipment of the day, which did not allow water to be carried in sufficient quantity to the heights of the tower. It finally collapsed, setting the nave on fire and burning it completely. Right: The neo-Gothic church. Left: the tower that survived. Shortly after the fire, the church was rebuilt again. In 1843, a so-called "shilling collection" was started, and in 1844 there was an architectural competition, won by the architect Gottfried Semper (a native of nearby Altona) with the draft of a Romanesque domed structure. His design, however, was not realized, as it did not fit into Hamburg’s townscape and shortly before this time, the completion of the mediaeval Cologne cathedral in 1842 had led to a Gothic revival in Germany. Hamburg’s medieval cathedral had been demolished in 1805. The English architect George Gilbert Scott (Father of George Gilbert Scott Jn. ), who was an expert in the restoration of medieval churches and an advocate of the Gothic architectural style, was commissioned to devise a new design. He designed an 86-meter-long nave, with a 28-meter-high vault. The architecture was strongly influenced by French and English Gothic styles, though the pointed spire is typically German. The amount of sculptures made from sandstone in the interior and on the tower was unusual. The new church was built to the southeast, a short distance from the old location, where the Neue Burg (New Castle) had once stood. The construction started in 1846, and on 27 September 1863 the church was consecrated. The 147.3 meter-high tower was finished in 1874. At that time, the Church of St. Nicholas was the highest building in the world until the completion of the cathedral of Rouen in 1876. Second to the TV tower, the tower of the church is still the second highest building in Hamburg. The clearly visible tower of the Church of St. Nicholas served as a goal and orientation marker for the pilots of the Allied Air Forces during the extensive air raids on Hamburg. On 28 July 1943 the church was heavily damaged by aerial bombs. The roof collapsed and the interior of the nave suffered heavy damage. The walls began to show cracks, yet neither they nor the tower collapsed. The basic structure of the Gothic church remained intact to a large extent and reconstruction was a realistic option. Nevertheless, it was decided to demolish the nave while leaving the tower untouched. As the vicinity of the church was no longer a residential area, a new Church of St. Nicholas was built in the district of Harvestehude. In 1951 the nave was finally demolished and the rubble was partially used for the reinforcement of the banks of the river Elbe. The loss of a valuable Gothic revival architectural monument was regretted by many, but after the war there were other priorities as far as reconstruction was concerned. Compared to the Church of Michael the Archangel, the Church of St. Nicholas was not regarded as one of Hamburg’s important landmarks. The tower and some remains of the wall were preserved as a memorial against war. For several decades they were not cared for, and, consequently, they gradually decayed. In 1987 the Rettet die Nikolaikirche e.V. foundation began to restore the existing fabric of the building and erected a so-called "place of encounters" (a room for events and exhibitions) in the crypt. The organization attempts to salvage pieces of rubble that were removed in 1951, such as pieces from the destroyed nave pulled from the River Elbe in November 2000. A reconstruction of the church, as it was done with the Church of Our Lady in Dresden, is not intended. However, a 51-bell carillon was installed in 1993 as a memorial. Since 1 September 2005, an elevator has taken visitors to a 75.3 metre-high platform inside the tower to history panels and a panoramic view over Hamburg and in particular the nearby Speicherstadt (lit. city of warehouses). Wikimedia Commons has media related to St. Nikolai (Hamburg). This page was last edited on 9 March 2019, at 11:14 (UTC).